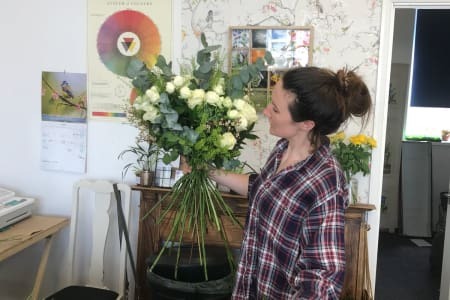 Environmentally conscious owner Holly of Holly and the Ivy Floristry, is a 29 year old florist and dreamer; and lover of anything and everything outdoors and to do with flowers. After designing and creating floral arrangements, Holly's favourite past time is enjoying long walks with her 4-legged friend - Chilli, a 2 year old Jugalier (Jack Russell, Pug & King Charles Cavalier Cross)! She appears regularly on their social media accounts! Holly has lived locally to Kingston all her life, studying in Twickenham and a little further a field in North London in both Events and Floristry. Having worked at some of the areas most prestigious event venues, Holly has nearly a decade of experience under her belt. Venues include Hampton Court Palace, Kew Gardens and Syon Park to name just a few. Over these 10 years she has accrued practical, logistical and technical experience across the Flower and Events industries. It allows her to focus on the finer details that other companies may miss, to ensure that no leaf is left un-turned to provide you with a one off experience. 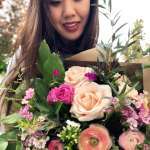 Her floral background includes both freelance and retail shop experience with clients ranging from Twickenham Stadium, Winq Magazine and the Elton John Aid’s Foundation. Her passion and dream has always been to own her own business and flower shop and after years of deliberating (8 years to be precise) she has finally made the leap! 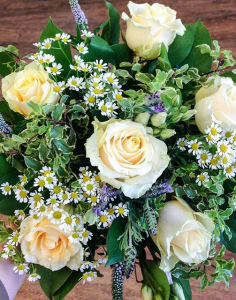 Holly is happiest when around flowers; Helping clients and students to design tailor-made arrangements for any occasion. She wants nothing more than to help bring to life your vision; conscious that every customer and student is different. Holly has a passion to make the design process as enjoyable for you as possible, in an honest, fun and friendly environment. So pleased with my wreath. Had a wonderfully relaxing evening with mince pies and great chat. Thanks Holly! What a fantastic class! Holly was very sweet and super knowledgeable. Upon arrival, she had cookies, nuts, chocolates & tea ready and all the floral materials prepared on the table. It was a bit of a trek from where I was staying but definitely work the commute for a great class. Thank you! 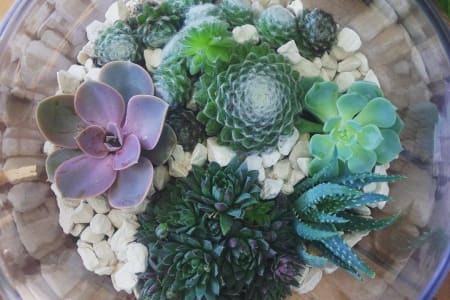 I took my mum on this workshop and we had an absolute blast, not only is it run by a truly lovely lady but it was both easy to do, had a fantastic result and left both of ya totally chuffed at what we had made. I really couldn’t recommend this more! Loved the workshop very much! Holly is a great teacher, very patient and full of knowledge. Love her little shop, it's filled with greenery and flowers, so pretty and smell so fresh! The whole experience was just so lovely! I'm definitely coming back for more workshops.